I know I often feel like this after a game. It must be age getting to my old bones, but a decent game on a weekend and I hurt in every muscle. Top to toe. 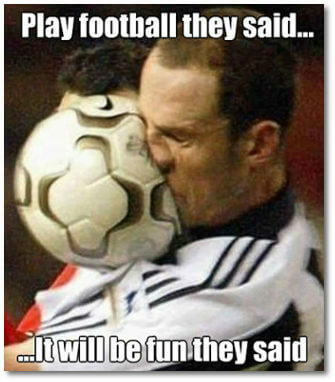 Play football they said ... it will be fun they said. I don't know what you guys do to relieve the pain 90 minutes of kicking a ball around manages to do for you - but all I can think of is a hot bath and beer. Not necessarily in that order. The heat to ease the muscle ache, and the beer to ease the pain of losing again ;-).